· Grind whole red chilli with little water into coarsely paste. · Wash and cut the mushroom into medium size and keep it aside. · Take a pan and add oil, add mustard seed, when mustard seed start to spluttering add the onion and sauté till transparent. · Add crushed ginger-garlic, turmeric powder, pepper powder, ground red chilli paste, salt,soy sauce and sauté for 2- 5 minutes. 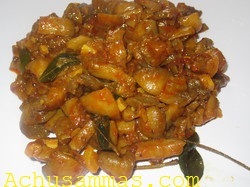 · Add mushroom pieces, curry leaves into this mixture and mix well. · Sauté well and sprinkle water if needed. Cook till mushrooms are done. · Finally add the lemon juice and mix well. Perfectly done dish..Looks very yummy.. Happy to follow you.. Do visit my space in your free time. 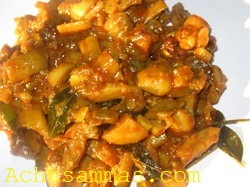 looks so delicious..perfect with rotis!! Great dish!A am drooling. Thanks for sharing it! Very delicious n looks spicy yum yum.. I have never prepared mushrooms like this, but it does look like I have been missing out. A strand of curry leaves? Sure wish I could find that around here. Delicious post! 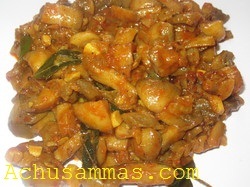 wow...hot n spicy mushroom masala...i am more tempted, lvoe it with rotis!! Very nice curry with rotis..